Prior to starting this project, I had thought very little about Catholic sisters or the role they play. 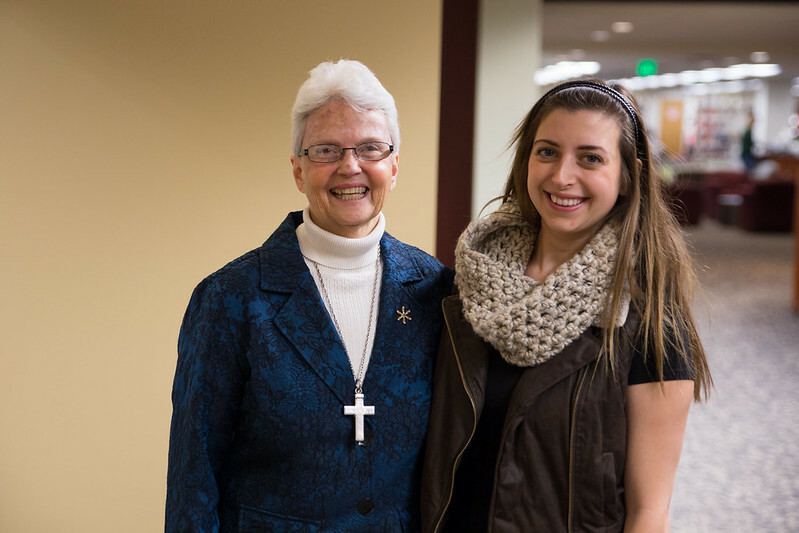 The first time I met a Catholic sister was in college at St. Catherine University. Three sisters came and spoke in one of my classes, which really opened my mind as to what it means to be a Catholic sister. These women were determined, extremely active in their causes, open minded and very charming. After that class I really began to think of Catholic sisters more often and in different ways. I realized that being a Catholic sister does not put a woman in a box. Each Sister has a unique identity and perspective on Catholic theology and social justice. Growing up, my parents would take me to Catholic Mass occasionally, however it was not a major part of our lives or my upbringing. In fact, today I do not consider myself religious in any regard. Almost all of the people I am surrounded by in my personal life also share my lack of religion. Before I met the sister I would be working with on this oral history, Sister Katherine, I felt nervous about how I would relate to somebody who had such strong religious convictions. All of my apprehension was swept away the first time I spoke to Sister Katherine on the phone. Her voice was welcoming and friendly. I felt instantly as if I already knew her; she did not sound like a stranger. Her enthusiasm for this project and for meeting me, made me instantly at ease. During our first in-person meeting, this sense of familiarity between us continued. Both of our outgoing personalities connected and conversation flowed as if we were long-time companions. We found ourselves sharing personal stories with each other during our first meeting and the connection we had continued with each of our following gatherings. We have gone on walks in her neighborhood in North Minneapolis where I had the opportunity to see how active she is within her community. Within a 10 block radius she seems to know who lives in each house and all of their stories. Spending time with Sister Katherine so far has taught me how I can relate so much to someone that I initially thought I had very little in common with. Gina Giambruno is a graduate of St. Catherine University. In the future she hopes to work in non-profit organizations, and one day go back to school for a graduate degree. Some of her interests include traveling, being active, and food. This oral history project is really exciting to her because she loves storytelling and learning about other people’s experiences. During the Fall of 2014 she was paired with Sister Katherine Mullin, VHM; a Visitation Sister. After completing her work as an oral historian she continued to work for SisterStory first as a production assistant and then as an oral history program assistant.